Summary: "The night has a myriad of different faces, and there is a man who peers into them one by one. His name is Midnight." Starting with this prologue, each independent episode tells us about the strange passengers that the central character Midnight encounters. Midnight drives a specially built taxi: it has a fifth wheel underneath the chassis that enables him to navigate any roads. The taxi and Midnight are one being, and no one but Midnight can drive it. But why does he choose such a lonely occupation? He works as a taxi driver because at one point, when he was leading a motorcycle gang, he caused an accident while he was driving with a girl named Mari. Because of the accident, Mari went brain dead, becoming a vegetable. 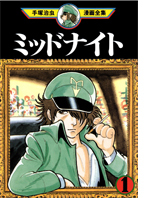 Midnight drives his taxi in the wee hours of the morning, looking for passengers that will earn him money for Mari's treatment.